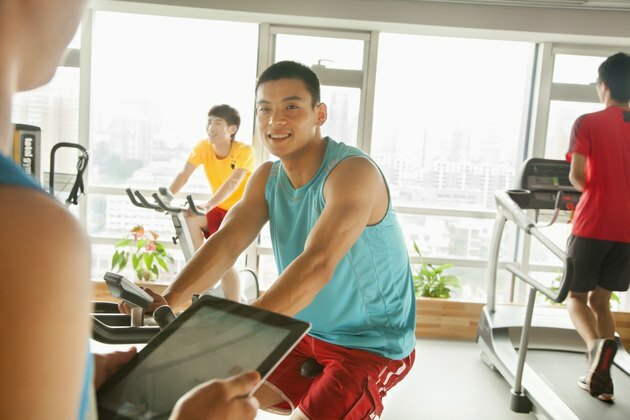 Is an Exercise Bike Good for Cardio? If your time on an exercise bike consists of leisurely pedaling while paying more attention to the overhead TV than to your heart rate, level of intensity or speed, then an exercise bike will not provide a good cardio workout. On the other hand, if you pedal briskly, with a medium to high resistance level, an exercise bike provides excellent cardio exercise. Intensity and frequency make a world of difference in increasing your cardio fitness. If you have knee, hip or ankle joint problems, such as bursitis or arthritis, riding an exercise bike allows you to exercise your heart and lungs without putting additional stress on weak or injured joints. Moreover, a bike offers exercise for those with balance problems, which can occur with older exercisers or those who have been inactive for a period of time. The American Council on Exercise notes that recumbent bikes provide support for you back and are a good choice if you have back pain. A panel of fitness experts, doctors and researchers assembled by “The New York Times” picked the elliptical trainer as a more effective cardio machine in the gym. However, they also stressed that whichever machine you prefer will provide an efficient cardio workout if you use it regularly. While the stationary bike scored lowest overall for the panelists due to minimal pedal resistance and a high boredom level, its cardio score was not that far behind all the other machines; treadmills scored highest with 88 points, ellipticals were at 80, rowing machines were 78, stair climbers were 79 and the stationary bike scored 75. Choose a bike with adjustable resistance levels to get the best cardio workout. Begin with a five-minute warmup and spend 150 minutes a week of moderate cycling or 75 minutes of vigorous activity, spaced out so you exercise almost daily. The American Council on Exercise advises that interval training is the best way to maximize a cardio workout. For instance, cycle for one or two minutes as fast as you possibly can, followed by a one-minute rest interval. Repeat the cycle of short, energetic bursts followed by recovery for 10 minutes. Work up to 20 or 30 minutes of intervals as your fitness level increases. Position the handlebars and seat correctly to minimize back, shoulder or groin pain. The bike seat should be level with the floor and just high enough so that your knees bend slightly at the bottom of the pedaling stroke. Adjust the seat so that your hips do not rock back and forth as you pedal. If you are at risk for bone density loss, alternate your low-impact biking with weight-bearing exercise such as stair climbing or running. Finally, vary which exercise machines you use to avoid overuse injuries that can lead to tendonitis or bursitis.